Blood is awesome. I’m a really big fan of how it circulates oxygen through my body and keeps me from being dead. That’s fantastic. But you know what’s not fantastic? When my blood stops being in my body, because then it stops being awesome and starts being something I can’t handle very well. Call me overprotective, but I’ve just always felt that my own personal stash of hemoglobin is best kept within the confines of my epidermis. Coincidentally, that’s also why I’m a really big fan of Band-Aids. Whenever I find myself in the unfortunate situation of sustaining unexpected blood loss, Band-Aids are my go-to solution. Nicked my hand on the edge of something sharp? Boom. Band-Aid. Didn’t notice the pointy obstacle on the ground until I rammed my leg into it? Boom. Band-Aid. Freak accident in the middle of my chainsaw juggling routine? Boom. Band-Aid. Okay, but seriously. 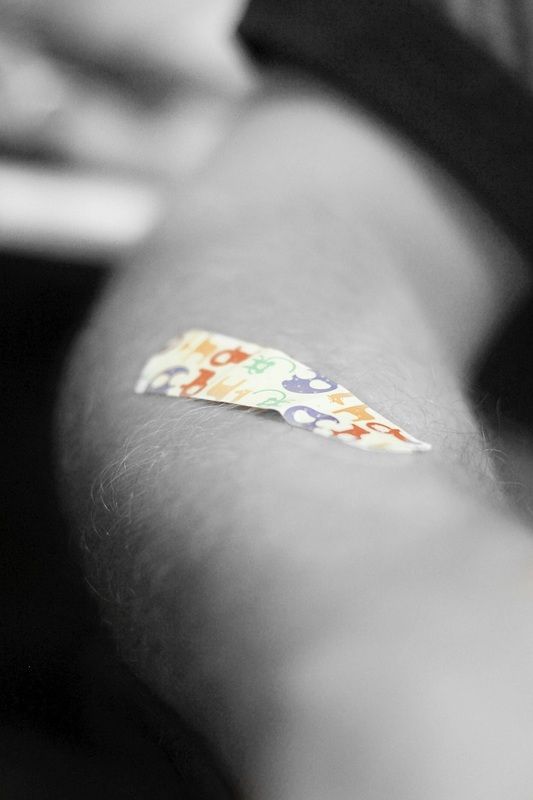 Band-Aids have their limitations, but they’re still extremely helpful when it comes to the healing process. If everything goes well, the Band-Aid covers and protects the cut while your body stitches itself back together—leaving, ideally, no trace of the original wound. That’s the best we can hope for with cuts and bruises, isn’t it? To get back to normal. For things to be exactly the same as they were before we caused the damage. Really, that holds true for just about any kind of repair process: The best-case scenario is for things to return to what they once were. And sometimes, if we’re not careful, we can start looking at our own lives through that lens. When we repent of a sin, for instance, our goal in asking God’s forgiveness is…what, exactly? To have the penalty for that sin removed, yes, but then what? To become what we were before we committed that sin? That’s not how God works. He isn’t looking for us to become what we used to be—He’s looking for change. Transformation. Paul warns, “do not be conformed to this world, but be transformed by the renewing of your mind, that you may prove what is that good and acceptable and perfect will of God” (Romans 12:2, emphasis added). We are becoming something different than we have ever been at any point in our lives. God, through His Spirit and His word, is reshaping the very core of our being—because that’s how God works. He takes what was and turns it into what has never before been. That’s His plan—it has been from the very beginning. Jesus Christ was “slain from the foundation of the world” (Revelation 13:8), which means that even before man was formed from the dust of the earth and given the breath of life, it was always God’s intention to open to us the door of salvation and eternal life. The plan was never to create a pristine human race just for the sake of seeing how long it would take us to break everything. God the Father and Jesus Christ are creating a spiritual family—so They may have started with dirt, but it doesn’t mean They have any intention of ending with dirt. I guess what I’m trying to say here is that God’s plan is about moving forward. There are vital lessons to learn from where we’ve been, but the heavier focus is always on where we’re going. Why? Because God is not the God of Band-Aids. His plan for the world has nothing to do with recreating the past—but it has everything to do with forging a brand new future. In one of the Bible’s closing chapters is a vision of a truly new time when “the tabernacle of God is with men, and He will dwell with them, and they shall be His people. God Himself will be with them and be their God. And God will wipe away every tear from their eyes; there shall be no more death, nor sorrow, nor crying. There shall be no more pain, for the former things have passed away” (Revelation 21:3-4). This is where we’re going. This is the future God is creating. In the very next verse, we read, “Then He who sat on the throne said, ‘Behold, I make all things new'” (Revelation 21:5). God is making all things new. That includes me. That includes you. That includes the entirety of creation. One Response to "Be Ye Transformed"
Appreciate the article, J-Lalls. A great focus during this time as we can all be creatures of habit. Happy Sabbath!